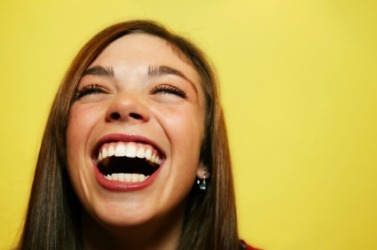 This woman is laughing at something funny. Funny is defined as causing laughter or out of the ordinary. An example of something funny is a joke that makes everyone laugh. An example of something funny is a fish that smells odd. The definition of a funny is a joke or something that makes people laugh. An example of a funny is a comic strip. "funny." YourDictionary, n.d. Web. 19 April 2019. <https://www.yourdictionary.com/Funny>. Informal peculiar, eccentric, crazy, etc. Counterfeit or fraudulent: tried to pass off funny money as legitimate. (UK) A narrow boat for sculling. Perhaps you would like to read those funny verses. He'd found it funny for his own reasons.